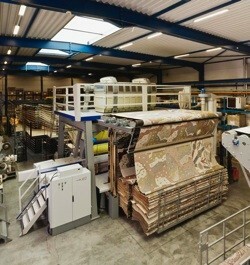 Van de Wiele develops, builds, assembles and installs carpet and velvet weaving machines. 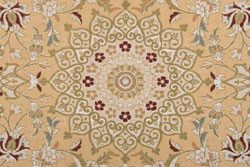 Carpet and velvet consist like flat weaves of warp and weft yarns, but have an additional third dimension: the pile yarns. Thanks to this unique weaving technique, our weaving machines can weave high-grade carpets and the finest velvets since more than 130 years, in weaving mills all over the world. During these 130 years, Van de Wiele has been growing constantly. Together with Bonas, IRO-ROJ, Memminger-IRO, Titan and Protechna, we share our knowledge and expertise in the broad area of textile technology. 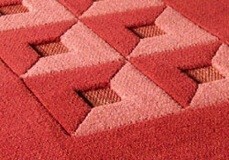 The main applications of velvet are upholstery, apparel and automobile. The Van de Wiele velvet weaving machines exist in an execution for plain and dobby velvet and an execution for Jacquard velvet. 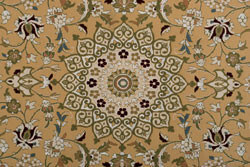 The Rug & Carpet Innovator RCi02 is a highly productive face-to-face carpet weaving machine. The ergonomic design guarantees easy access to all the yarns. The insertion of the filling is done by rigid rapiers, guided on air cushions reducing the friction and the heat development. 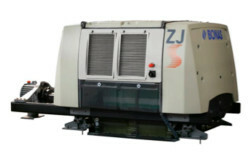 A three-dimensional cam, for an optimal cutting across the full width of the machine, drives the knife of the cutting motion. A powerful parallel reed beat-up produces at high speed a clean back and nice pile aspect. On the RCi02, servomotors can drive the heddle frames for the tight warp while dobby rotors can drive the heddle frames for the slack warp. The weaver regulates the heddle frames timing of the tight warp and the heddle frames motion can be programmed. 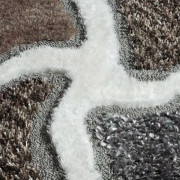 He has the possibility to change quickly the weave structure and switch between carpet qualities. 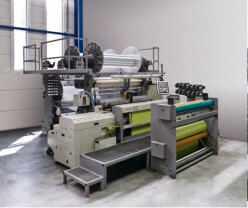 A compact Jacquard machine with simple selection mechanism without springs, pivot points and pistons allows to obtain, with only one solenoid per harness band, the positions for double and triple rapier carpet weaving. 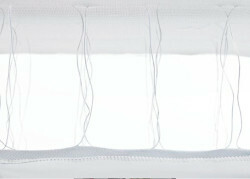 Only one flexible hook is moving making the system not sensitive to dust. 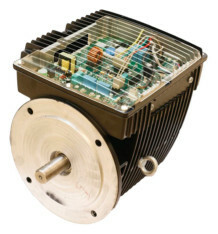 As the solenoid is current driven, the selection is independent of temperature, guaranteeing a fault free selection in all conditions. The pile yarns are levelled in layers, so the crossing point of the different colours is shifted. This increases considerably the weaving efficiency and produces a clean back with less incorporated pile yarn. 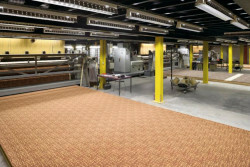 For weaving single rapier weave structures, the rapiers insert alternating a filling in top and bottom carpet. 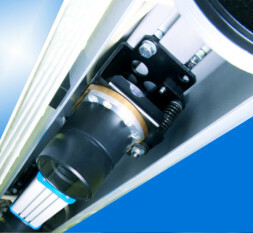 With the rapier switch-off system, only one rapier is inserted per cycle. 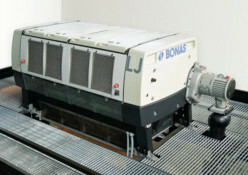 The system, with a minimum of moving parts and no empty rapier, enters into the shed and increases the weaving efficiency. Alternatively, the filling scissors can be programmed for presenting only one filling per machine revolution. Weaving with three rapiers gives 50% more production than the three shot weave structure on a double rapier carpet machine. The patented three rapier system gives other advantages: incorporated yarns stay stationary giving a clearer carpet back and less incorporated yarns. The Hand look Carpet innovator HCi03 is a three rapier weaving machine weaving carpets with back side like hand knotted carpets, this means, without visible warp yarns at the back of the carpet. 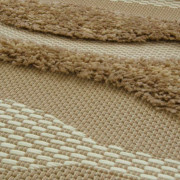 As this kind of carpets is made in a high reed density (mainly 1000 dents/m) and with up to 8 colour frames (or 500 reed/m up to 16 colours), it becomes for an expert hard to see the difference between hand made and machine made carpets. 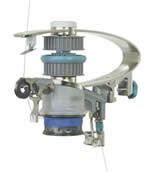 Further developments with the three rapier technique are the Universal Cut innovator UCi03 carpet weaving machine. It's the only machine on the market that weaves two identical carpets with cut pile, soft short, long loops and flat weave effects. 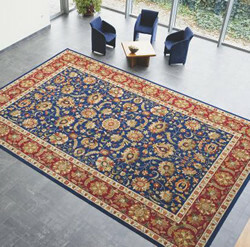 This kind of carpets with relief is getting more and more popular. Van de Wiele has developed an execution of this machine, the Universal Shaggy innovator USi03 carpet weaving machine, for weaving cut-loop carpets with long pile. 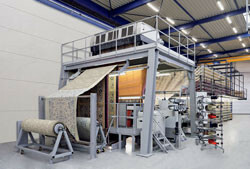 To cope with a growing demand towards carpets with high pile, Van de Wiele is offering the Shaggy Rug innovator SRi02 carpet weaving machine. 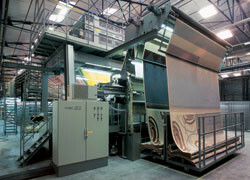 This two rapier weaving machine can weave super shaggy carpets up to 2 x 70mm with the face-to-face weaving technique. The Master in Axminster MAX91 is the first machine in history completely designed and developed for weaving Axminster carpets at a high speed. 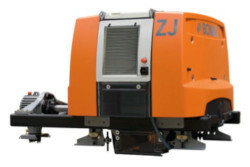 The MAX91 has a stable basic machine with a robust ground frame. 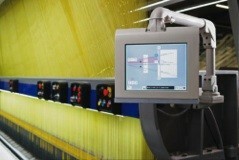 The pile yarn presentation is done through a non-reset system with individual stepper motors, giving the possibility to work with up to 32 colors. The knife bit carriers are driven by a servomotor programmed for a quick motion during cutting and with a slow return motion to reduce the temperature. It is possible to weave with different tuft lengths. The new patented gripper is made in one piece, without pivot point and without bearings. 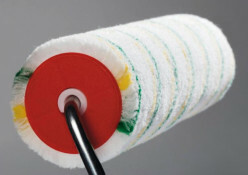 This lightweight gripper is suitable for gripping thick and thin yarns, even mixed in the same carpet . For high quality contract carpets, the Advanced Wire innovator AWi01 as well as the Carpet Loop weaving machine can be used. 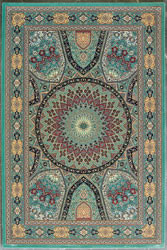 An adapted execution is weaving lightweight carpets and prayer rugs. The Velvet Tronic VTR23 model is producing plain and dobby face-to-face velvet for upholstery, automotive, dress and technical fabrics. Depending of the application the machine is equipped with one, two or three pile beams and pile deliveries. The electronic rotary dobby for pile and ground heddle frames build in a way to have a stable weaving machine, assures a perfect velvet quality. 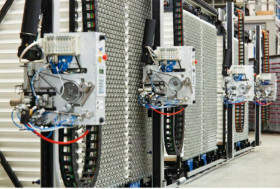 As member of the Van de Wiele Group, Bonas Textile Machinery is the world leader in the design and manufacture of Electronic Jacquards. 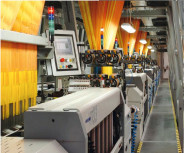 As member of the Van de Wiele Group of Companies, the IRO group is the worlds leading producer of yarn feeding equipment to the textile industry. 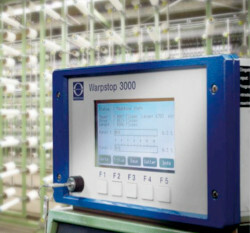 As member of the Van de Wiele Group of Companies, Memminger-IRO is the market leader in processing technology for yarn infeeding, control systems and lubrication technology for knitting machines. As member of the Van de Wiele Group of Companies, Titan is the market leader in finishing machines for the carpet industry. More and more, electronics are integrated into the weaving looms. 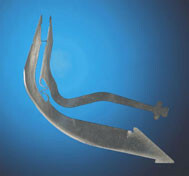 Until today, the shedding is still done by conventional mechanical dobbies. With the new AROS electronic shedding motion, this era can come to an end. 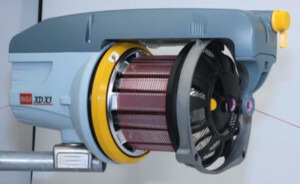 The iShed (intelligent shedding) gives you energy savings due to the optimised energy consumption through inertia recovery. 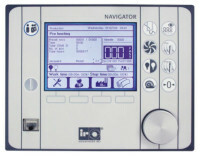 The whole system is very compact, user friendly and requires a limited maintenance. This new iShed will give a lot of opportunities for the users and results in better efficiency, higher productivity and less power consumption. 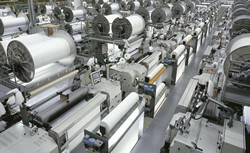 Opto-electronic thread control systems for the textile industry.